Fast forward to race day. The day dawned with drizzle and a single digit temperature. 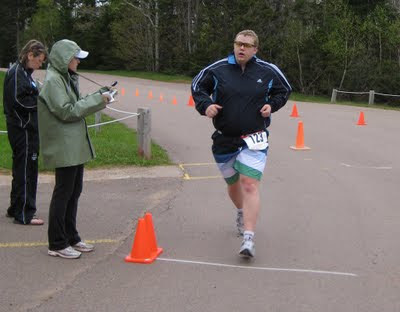 Not the nicest way to start a race, at least the swim was going to be indoors in a heated pool. By the time I get to the site, I'm feeling butterflies like I haven't felt in years. Not since I used to do some X-Country Mountain bike racing had I felt like this. I was by this point very worried, but it was too late for second though now. The race was setup with a number of heats because the pool only had capacity for 5 at a time. To keep the finishes relatively close, the slower swimmers such as myself and Rory were placed in the first heat. As they count down to the start my nerves really start to get to me. I'm vibrating in the water, I think I might puke, "please please please let me get through this swim in good shape". We're off, I'm off on my first lap. Feeling strong, but pushing much too hard too soon. Pure adrenalin is charging through my veins. 3 laps later I'm gasping for air, my strokes are all out of rhythm, my technique is out the window and I'm worried. "Just keep going.... don't stop, you can do this. It's just like training, CALM DOWN!" I take an extra breath at the end of the pool while turning, then settle down into a proper pace and get my stroke bake in order. I've long since lost track of how many laps I need to do, so I keep plodding along, they will let me know when I'm done. I sneak a glance at the clock, "25 minutes in??? I better be done soon." I start to worry that I won't make the 30 minute cut off time. Then the most welcome site of the morning, a flutter board in the water at the end wall... My signal that I've made it through the swim. Jump out of the pool, grab a towel and start to dry off as best I can while running out side to the transition zone where my bike is waiting for me. Step out the door... "GASP, it's freezing out here!" I get into my socks, bike shoes, jersey, jacket, helmet, and glasses. Stick an energy gel and a banana into my pocket and head out. "God it's cold...." Out on the bike course I settle into a good comfortable pace. I'm getting passed by several others on much faster bikes as I begin to regret using my mountain bike with off road tires for this, instead of borrowing my fathers road bike. Rory rides by with road tires on his mountain bike...He's always been a stronger rider than me anyway. "Oh well, I'm just here to finish, not win" I have to keep reminding myself. If nothing else, my Mountain bike is comfortable with it's dual suspension, and familiar to me. The ride is uneventful, but with a head wind on the outbound leg, it's a bit of a tough ride, but nothing I can't handle. I use the "easier" time to get some nutrition, and hydration for the run ahead of me. I arrive back at the transition zone to change to the run. Park the bike, pop the bike shoes off, and slip on the runners. Take one last gulp of Gatorade and head off! "Gahhh! I can't feel my feet!" The combination of being wet from the pool and the tight bike shoes have completely numbed me from the waist down. I hear my feet smacking the ground instead of taping it, I can't control them properly. This style of running is starting to hurt my calf's, and I'm not even 1k into this thing! I mentally put my head down, and just concentrate on my stride, as the feeling gradually returns to my feet. As I approach the turnaround point on the run course, I see Rory heading back towards me at the same time as my father (who started in a much later heat) catches up to me. We all exchange encouragements and then I'm all alone with my doubts again. "This is too hard, I'm not even half way there and I'm dead. How am I supposed to do another 3k of this???" I hit the turnaround, the wind is now at my back, the road is down hill, and I start feeling strong. "I can do this! I am invincible! Bring it on!" The music from Rocky starts playing in the back of my mind.... Yes I know it's cheesy, but when you need encouragement, you'll take what you can get. The next 2k pass in a blur, and I find myself on the final stretch back to the finish line. The line is in sight! I give it one last push and "sprint" across the line. I finished dead last by about 10 seconds, I completed each of the 3 legs without taking a break, or even walking on the run portion, which in any case the my only real goal that I had set for myself. Will I keep up the triathlons and work towards the big ones like my father and sister? Probably not. Will I do another sprint tri? Definitively!